THIS CONTEST IS CLOSED. Thanks for participating! Don't forget you have until 11:59pm Eastern USA Time, Friday, May 2, 2014, to enter the the current giveaway. 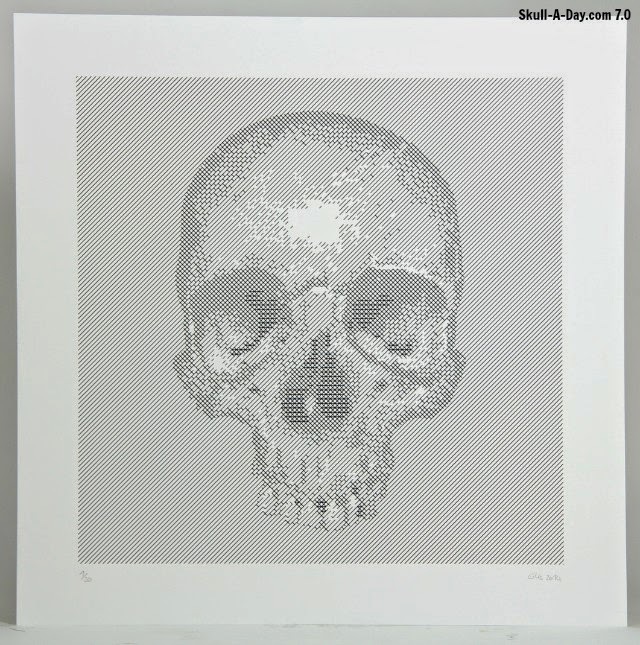 Eike of Designers Skulls is giving away a Skull Silkscreen Print to one lucky Skull-A-Day fan. You can find the original contest post by clicking the side bar ad, or this link. 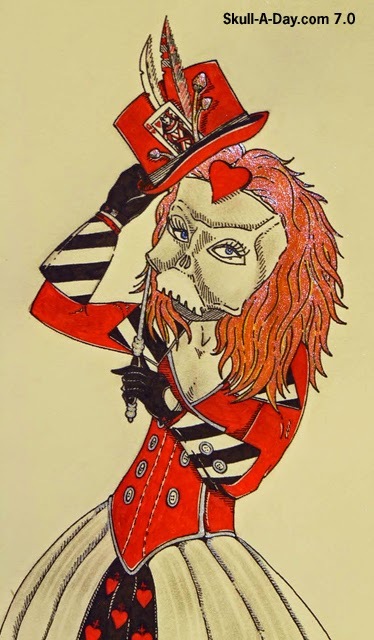 Peter McKeown of Melbourne, Australia is "playin' with the Queen of Hearts" (sorry, I can't help but think of that song). He's here today with a masquerade mask inspired by the Red Queen from Alice In Wonderland. This fiery haired beauty was created with pencil, gel ballpoints, and glitter gel pens. Unfortunately, it's almost impossible to capture the shimmer of her style, but if you look close enough you'll see the sparkle. Thanks for sharing such an exquisite piece, Peter! 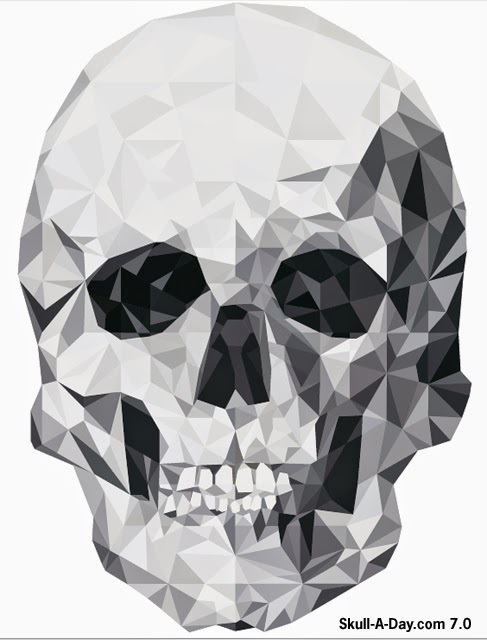 Eike is a German artist who has a "Skull of the Year" contest on his website Designers Skulls, choosing the best international skull artist. 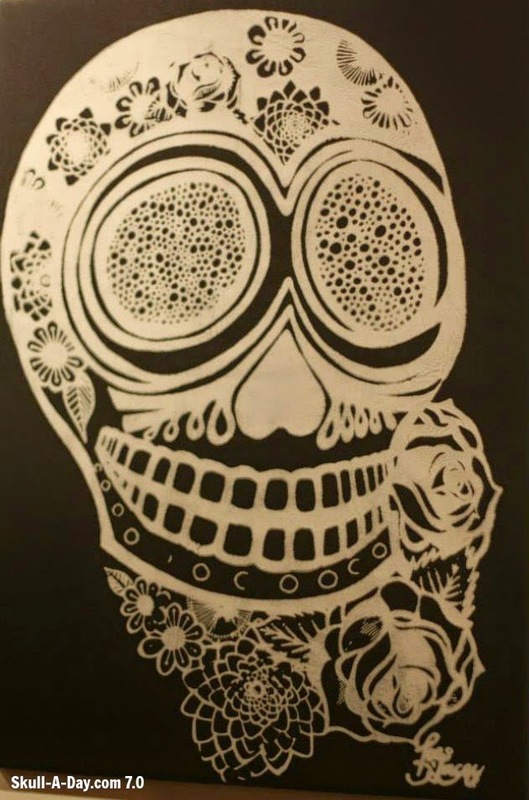 He's a graphic designer by trade, and continues practicing by creating skull artwork. 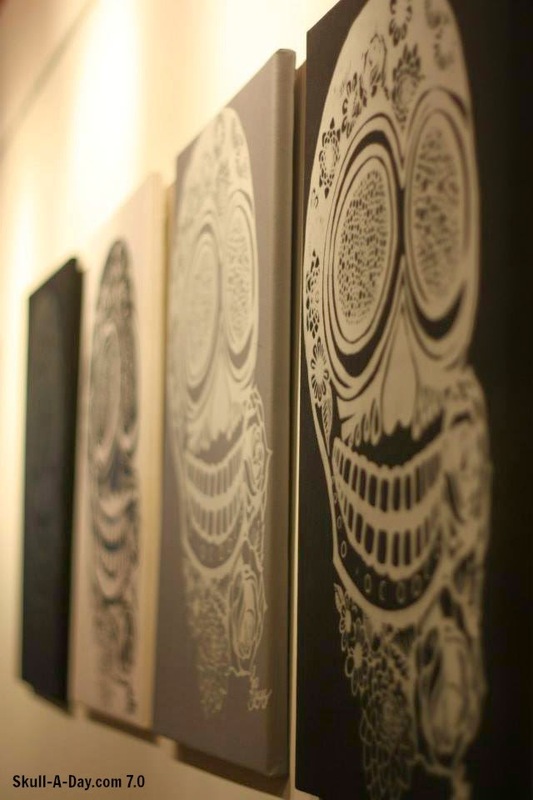 One of his recent skull creations, in shades of black, was made into a series of silkscreen prints. 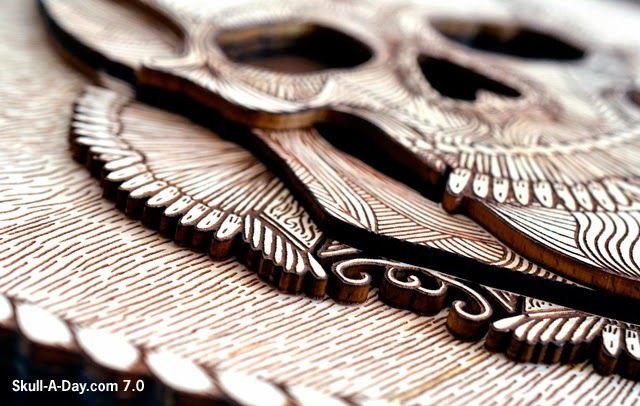 Eike wants to share his work by giving away one of these prints to one lucky Skull-A-Day fan! HOW TO ENTER: To enter this contest, comment below with an answer to this question. 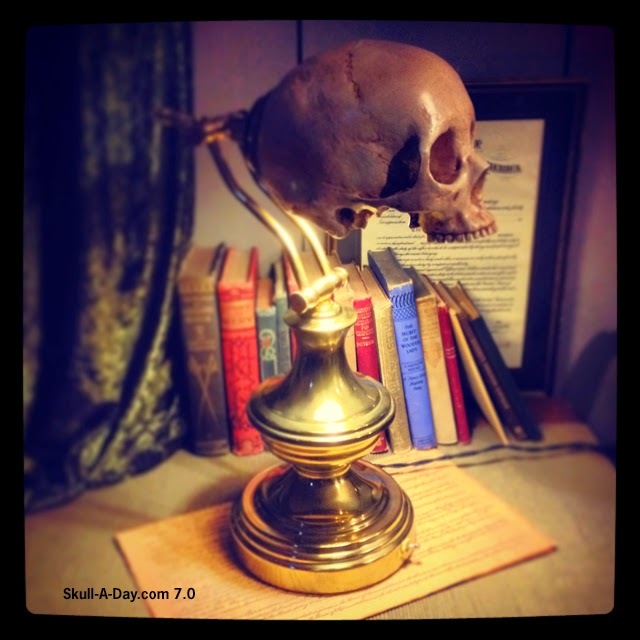 Since Eike runs a "Skull of the Year" contest, who is your favorite skull artist? CONTEST CLOSES: 11:59:59 PM Eastern USA Time Friday, May 2, 2014. 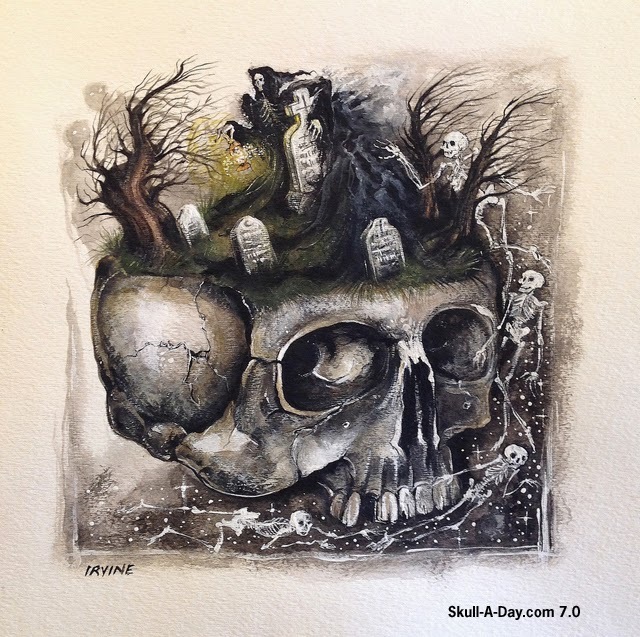 IF YOU DON'T WIN: Eike is offering a 25% discount on prints, including shipping, to Skull-A-Day fans. Limited edition prints are available by email request, info@das-x.de. You can see more of Eike's work on his blog, Kopfblog. Skeleton Cardboard was being very observant when he spotted today's map simulacrum. This is a boating lake in Victoria Park, London. 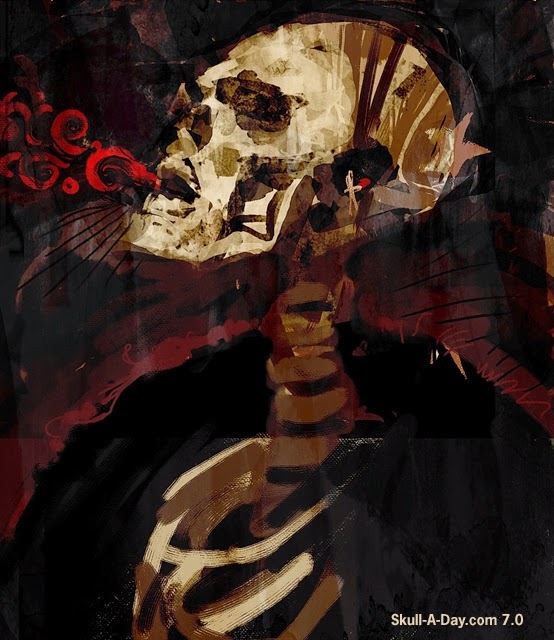 By looking at the words on the map as a reference I can see that this skull is not running North and South, but more Northeast to Southwest(or vice versa). Either way, it should be renamed "Skull Lake". Thanks for sharing your awesome find, S/C! María Nikólskaya is doing some tremendous work in Bilbao, Spain. 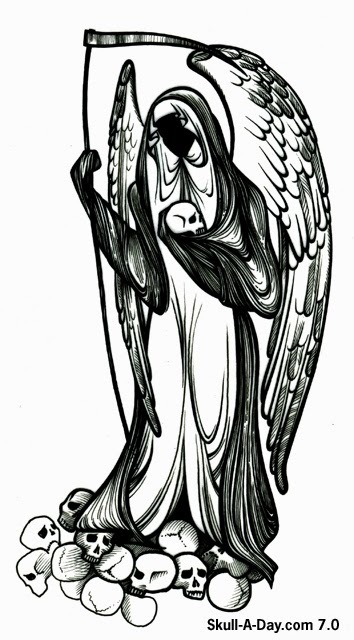 These two wonderful designs from the illustrator and tattoo artist can easily represent the bringers of life and death. The beginning and the end. María is such a huge fan of our site that one of our readers is being offered a chance to wear one of these designs for life for FREE. If you are in the area of Bilbao and want some awesome ink work tattooed on you for FREE then look for María and mention that you saw this on Skull-A-Day. Thanks for sharing these illustrations and for the excellent offer, María! 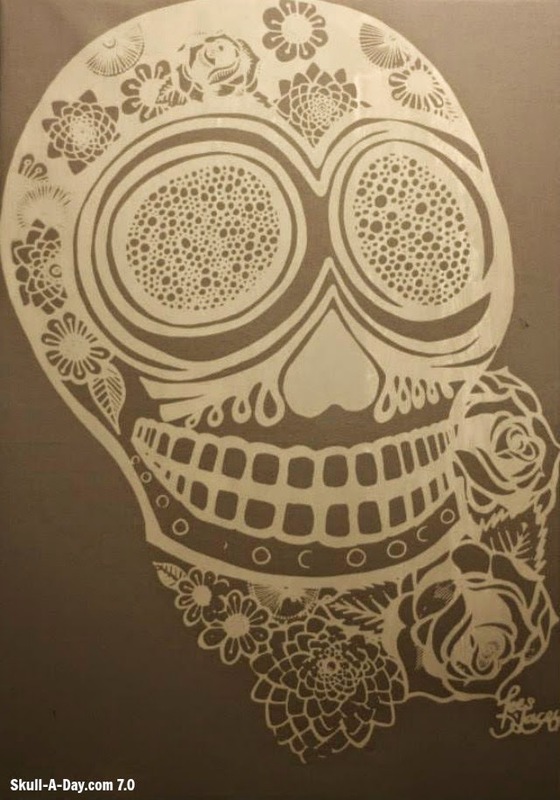 Rachel Quinlivan of Alabama, is back, with a painting of conjoined skulls. I'm fascinated with skeletal deformities, since I have a few myself. Conjoined ones are extreme deformities, from the cells not fully dividing for twins. The most famous conjoined twins are Thai brothers, Chang and Eng Bunker, who were attached at the chest and shared a liver. They lived to be 63, and had families. The term "Siamese Twins", comes from these two brothers being billed as when traveling with P.T. Barnum. Nicole Snyder from the Poconos, PA was a kind enough friend to create this Tibetan skull, a fabric applique, for her friend's laptop sleeve. Then she was gracious enough to share it with us. Now it's our turn to continue the cycle by presenting it to you. Perhaps you might be obliged to pass it along to...... Thanks for sharing your work with us, Nicole! Today's skulls are the handy work of Massachusetts welder, Jay Carlson. 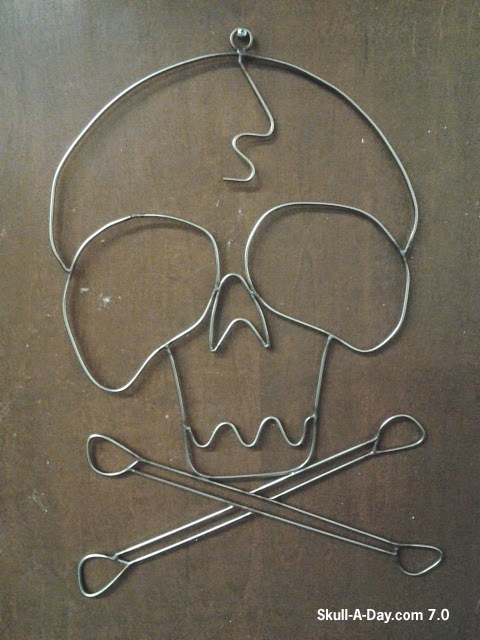 The welded wire skull measures 16" x 22" and is made of 5/32" stainless steel. Jay has also spent 15 years doing art and antique restoration specializing in old art frames. 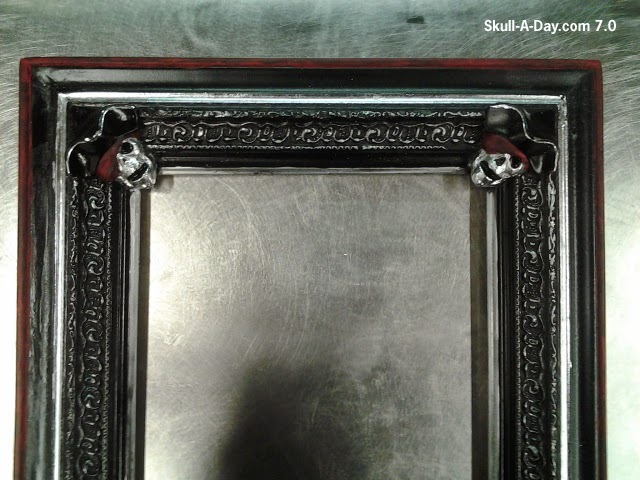 This pirate skull frame would be perfect for a picture of your favorite "booty". Thanks for sharing these, Jay! 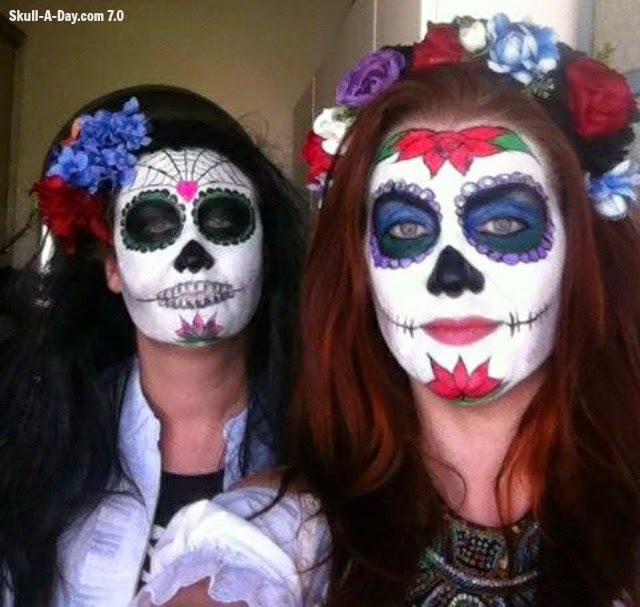 Friends, Tanya and Chloe attended "day of the dead celebrations in Melbourne, Australia last November". Chloe, an artist, did their make up which took approximately four hours. Another beautiful version of Dia de los Muertos makeup. Thanks for sharing ladies! Just throwing a flashback out there for those who celebrate today as a holiday. This revisit to my Tuesday With Tatman from 2010 goes out to all of you out there enjoying the moment! 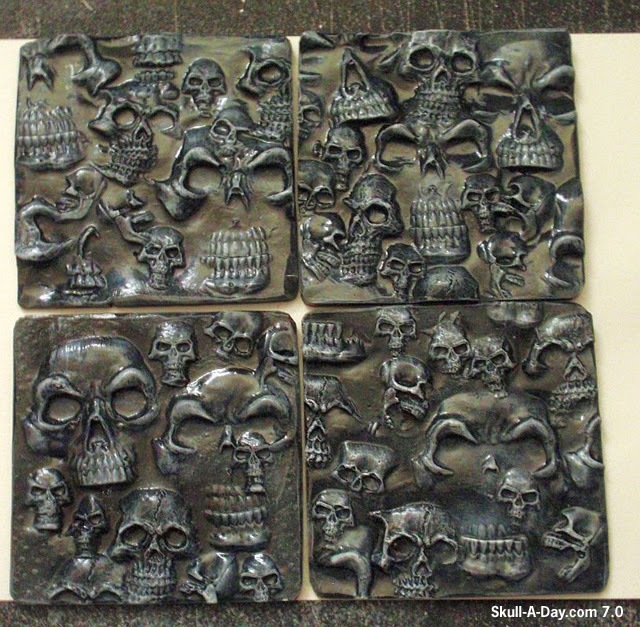 Bat Fastard is at it again with this killer set of skull tiles. Accents to be used in whatever room of your home that needs the most skullifying. 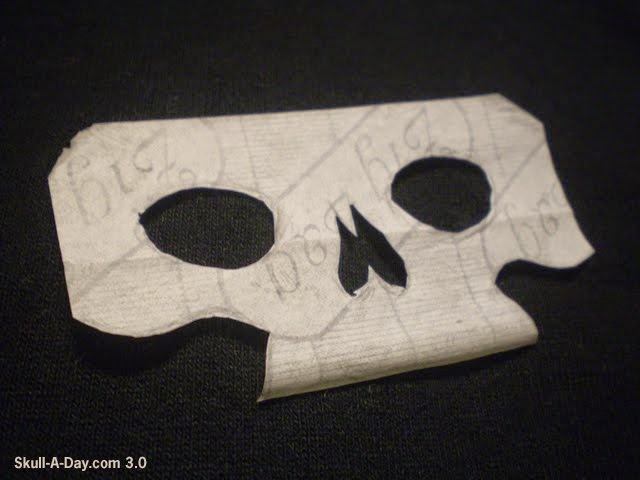 A proper way to make sure that your house of skulls is duly tiled. Thanks again for the submission, Bat! 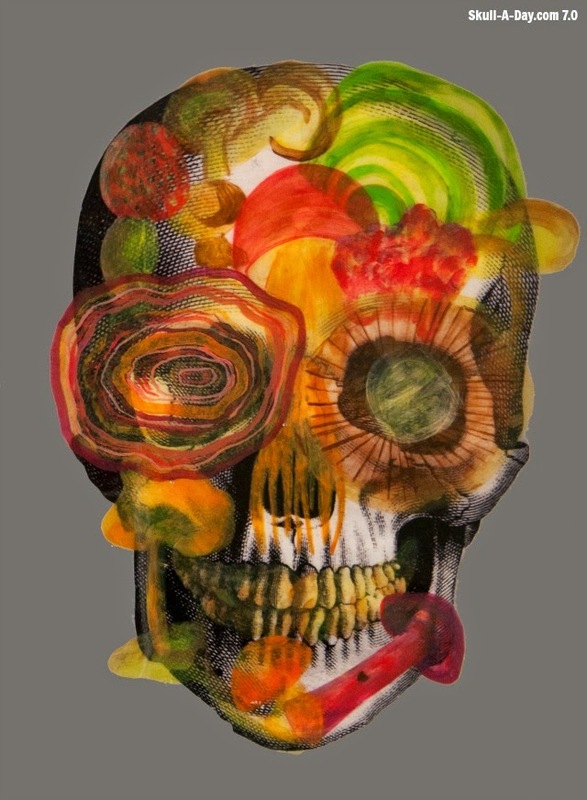 Tees D'Lacey from Edinburgh, Scotland, created this "hand pulled screen printed textile skullduggery". I've been in love with printing, since the 1st time I carved a linoleum block. I've been wanting to try screen printing for a while. No two prints are exactly the same, but that's the beauty of it, the hand made quality. Don't forget you have until 11:59pm Eastern USA Time, TODAY, Friday, April 18, 2014, to enter the the current giveaway. 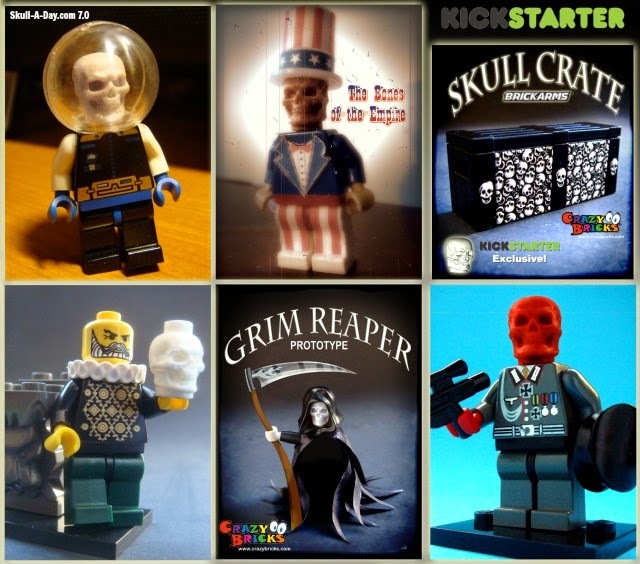 Crazy Bricks is giving away a set of mini Skull LEGO Heads lucky Skull-A-Day fan. You can find the original contest post by clicking the side bar ad, or this link. 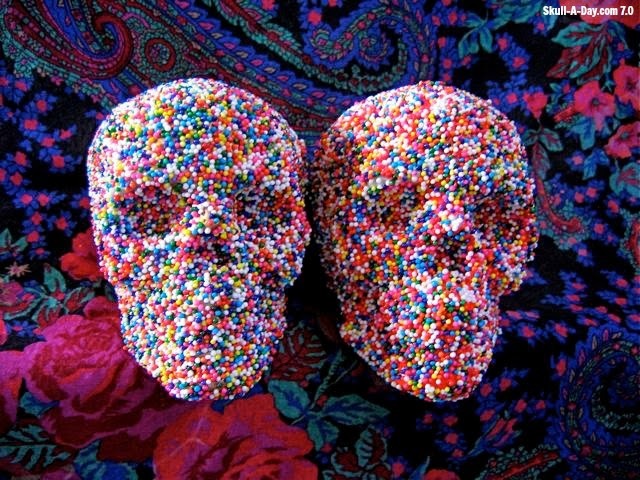 Hank created this pair of skulls using nonpareils candies. Though these are sculptures, I think they would be great tiny skull cakes. Cover them in icing and nonpareils for little edible skulls. The cake version of sugar skulls. 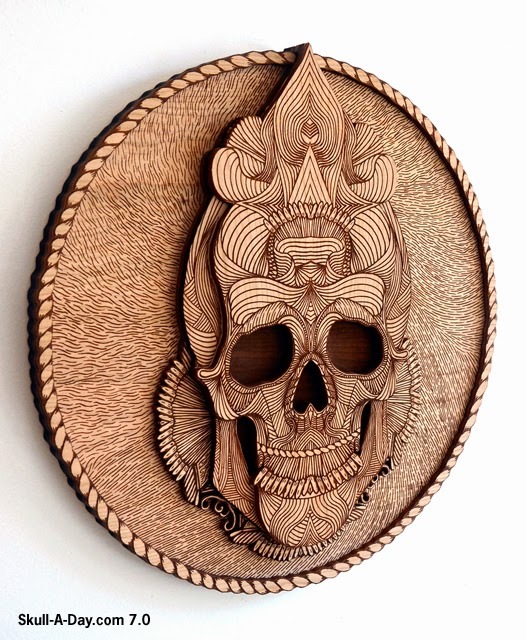 This wonderful woodwork skull is a collaboration piece between Joan Tarrago & BIG SECRET. It consists of 5 laser-etched and laser-cut layers at 14.75" circular. I've been a fan of wood cut etchings for a long time, but the 3D effect of the layering has me really loving this. Thanks for sharing this piece of awesomeness with us, Jason! Don't forget you have until 11:59pm Eastern USA Time, Friday, April 18, 2014, to enter the the current giveaway. 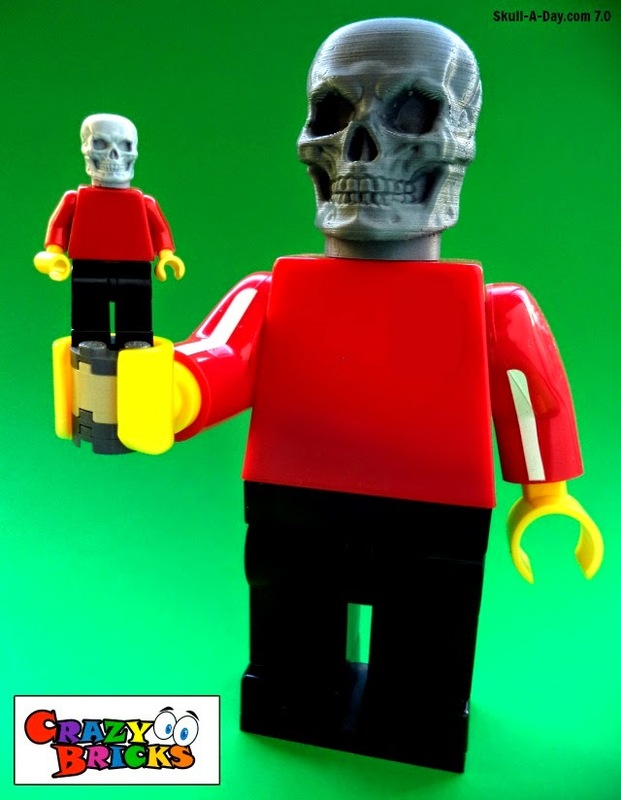 Crazy Bricks is giving away a set of mini Skull LEGO Heads lucky Skull-A-Day fan. You can find the original contest post by clicking the side bar ad, or this link. This bit of mathematical art work is courtesy of Sergio Gómez. He's taking common shapes and transforming them into much more. Of course we love his skull the best, but there's a lot more to his work than that(including some noticeable movie characters). Thanks for sharing, Sergio! THIS CONTEST IS CLOSED! Thanks for participating. CrazyBricks makes custom and unique plastic-injected parts compatible with everyone's favorite miniature figures and LEGO® bricks. They make everything from specialty arms to zombie Gingerbread Men! They have recently released Skull Heads for LEGO figures. They want to give away a set of head to one lucky Skull-A-Day fan! Here are some ideas of how you can use the skull LEGO heads. PRIZE INFO: A complete set of 9 Skull LEGO heads in a choice of color. The set can be either White, Tan, Red, Clear, or Glow in the Dark. HOW TO ENTER: LEGO figures are meant to go on adventures in the large LEGO universe. To enter this contest, leave a comment answering this question. If you were to win these Skull heads, what adventures would they have? For example, I'd make them into pirates and man a ghost ship. Also tempted to have them in castle, for some haunted fun. CONTEST CLOSES: 11:59:59 PM Eastern USA Time Friday, April, 18, 2014. IF YOU DON'T WIN: Don't fret. Crazy Bricks is offering 10% on all orders, if you use "skulladay" at check out. You can see what else Crazy Bricks is up to on their Facebook page and Flickr. Today's simulacrum are happy to see that two people set a great example by getting outdoors and noticing the amazing world around them. The first was found by avid rock & fossil hunter/skull enthusiast, Jen Craniac of Peru, IL who noticed this stone gazing up at her near her favorite creek. 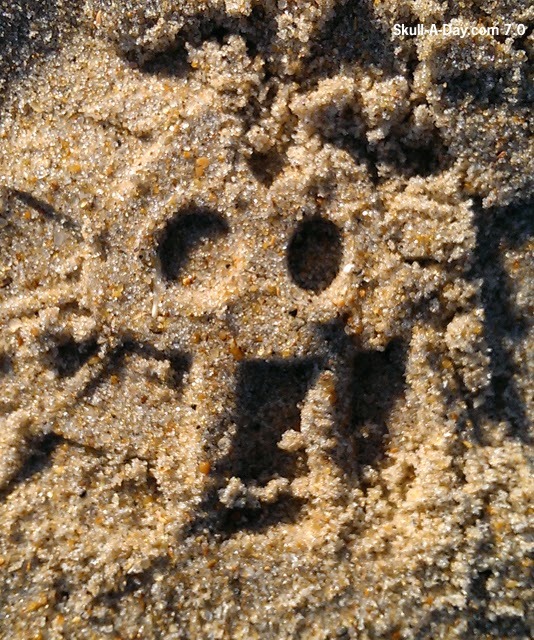 The second was discovered lying in the sand in Duck, NC by Stacie Alvarado of Richmond, VA. Thanks to both of you, Jen and Stacie, for keeping your eyes wide open while enjoying what Mother Nature has to offer. Remember, if you find your own sneaky skull simulacra then submit it so we can share your find and keep the hunt alive. 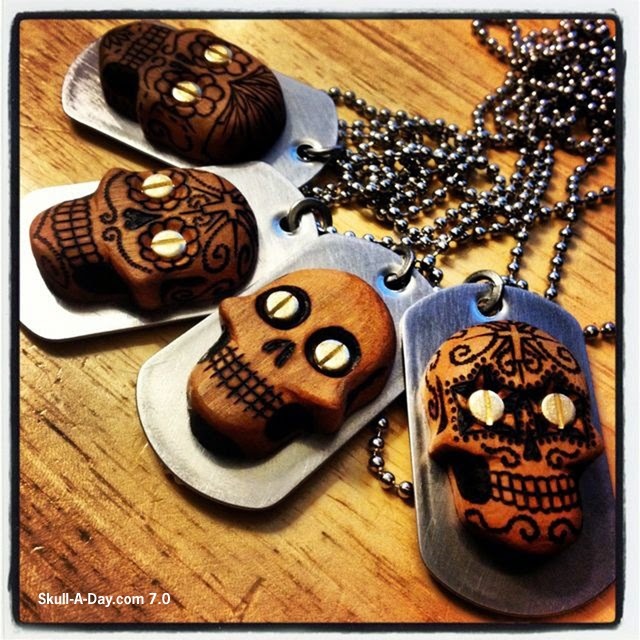 Down around Lexington, South Carolina there's a guy named Alexander Hibbs who is creating a new way to identify your living corpse with these hand carved and wood burned "skull tags". 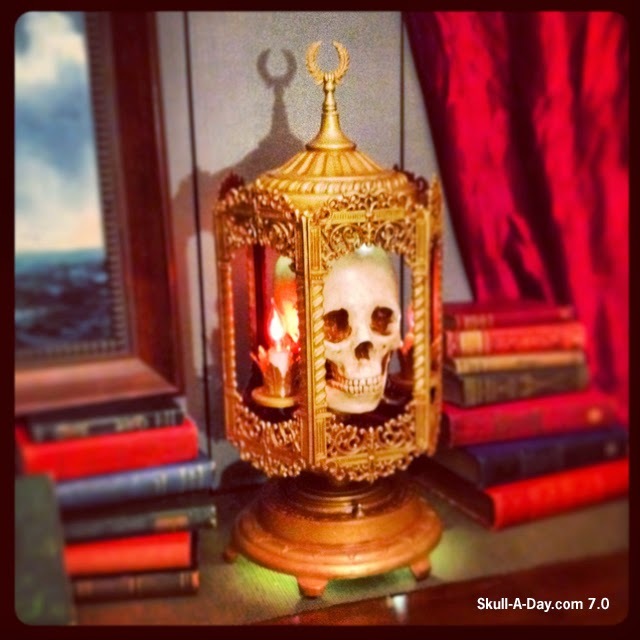 As the artist behind Beaulieu Designs, Alexander is making all sorts of excellent skullery. 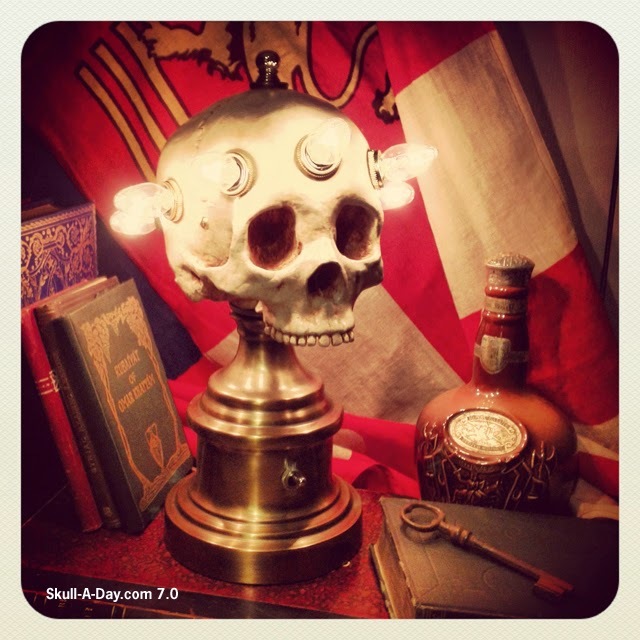 I had to include these skull lamps that he has made from various other parts, thus making them truly one of a kind. Great work, Alexander! Thanks for sharing! Emily Nolan is a painter from Toronto, ON. "Biology and the inner workings of living bodies fascinate Emily Nolan and provide recurring themes in her work. 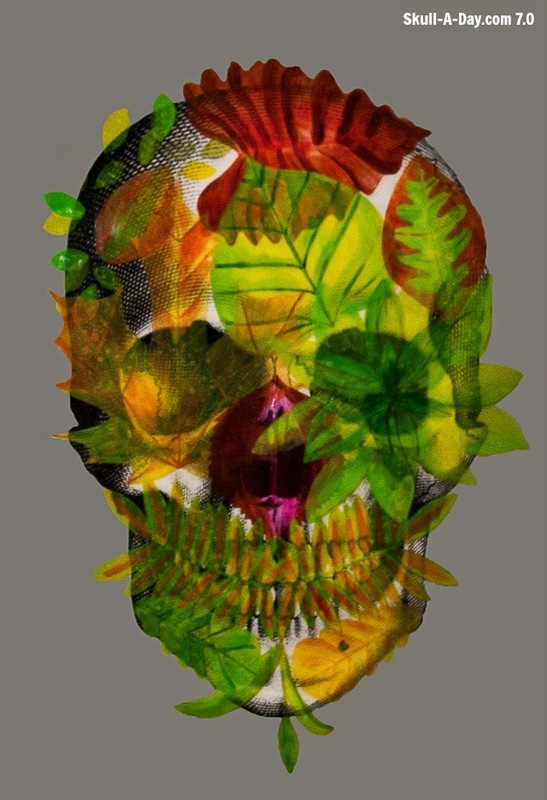 Juxtaposing elements of decaying human life with organic flora and fauna filled with vibrancy, colour, and potential, Emily delves into the cycle of life from birth to death, deterioration to regeneration. Her epoxy-coated images offer luscious, candy-coated memento mori that draw from both traditional and contemporary culture." I'm always drawn to artwork that blends nature and anatomy. 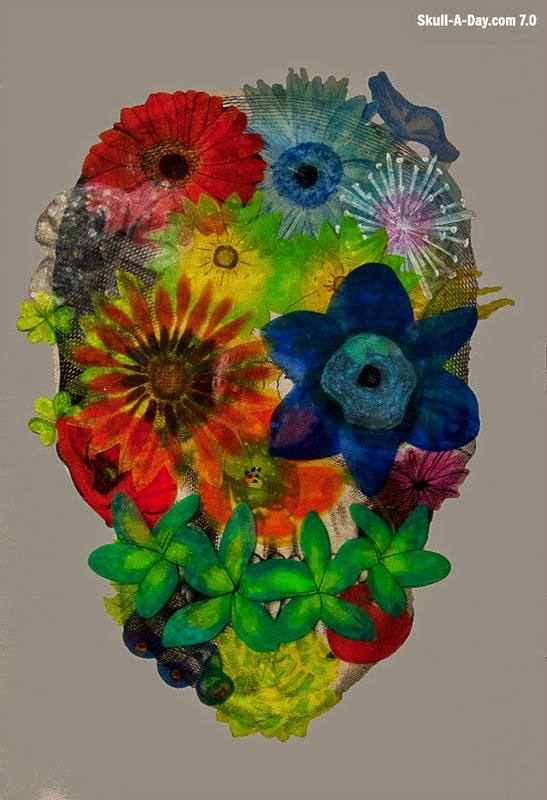 Emily's work has vibrant flora that follows the shape of the skull. I'm sure these are something you'd have to see in person to fully enjoy the depth of colors. Don't forget you have until 11:59pm Eastern USA Time TODAY, Friday, April 11, 2014, to enter the the current giveaway. 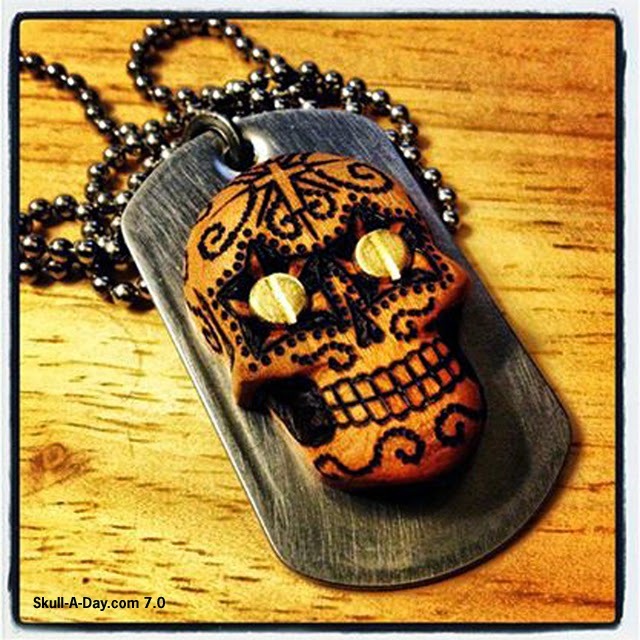 Robertas, of Wooden Skulls is giving away a wooden skull mask to a lucky Skull-A-Day fan. You can find the original contest post by clicking the side bar ad, or this link. Noah's daughter had a birthday recently. I was trying to think of a present to make or buy her. 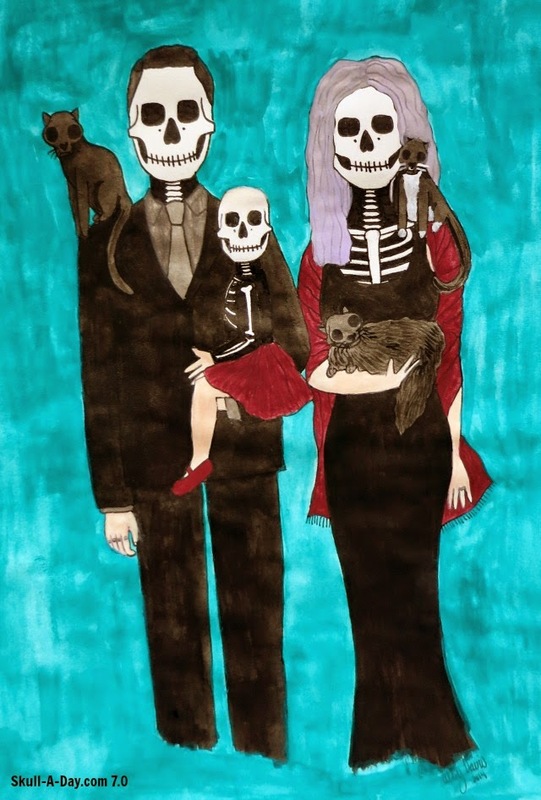 While flipping through my sketchbook one day, I came across the Skeleton Family Portrait I'd done for my own family. It dawned on me that this concept would be perfect for the little Scalin family. I included their three cats, since pets are furry family members. I drew this with pencil, inked it, and painted it with watercolors. This digital painting is courtesy of the "Art of Z"(Daniel Zollinger). The skull is spewing forth an ancient artistic dialect and "Speaking In Tongues". Communicating in a way that we all understand. One voice coming from the dead........ Thanks, Z! In Toronto, Canada there's a twisted tree with The Gnarled Branch stemming from the creative mind of David Irvine. His works are full of vintage style and are classics in their own category. 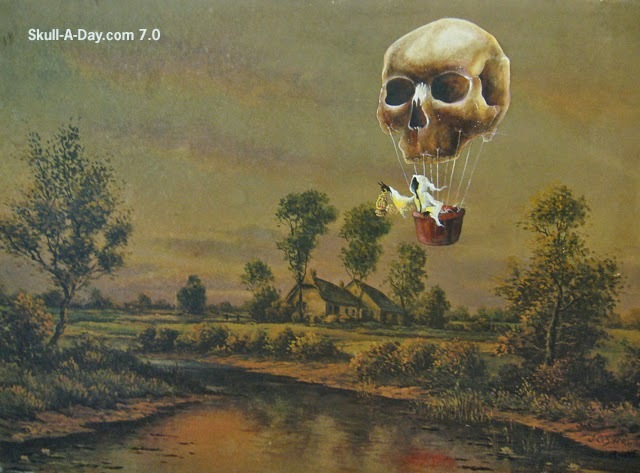 I especially enjoy his Re-Directed Thrift Store Paintings series. Thanks for sharing these, David! 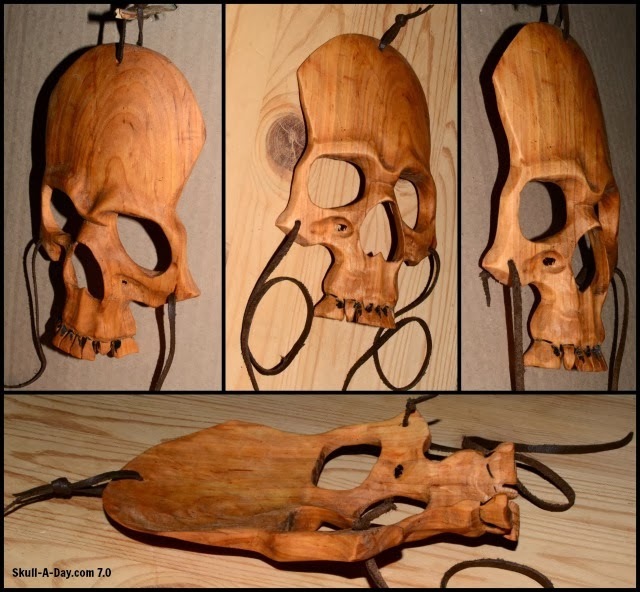 Robertas, of Wooden Skulls, is a wood carver from Lithuania. 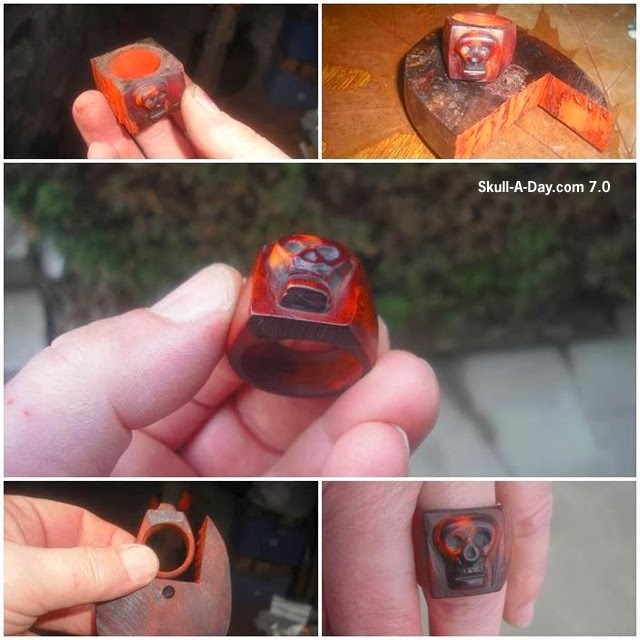 Skull carving has been his hobby for over 10 years. He makes hand-carved wooden skulls, life-size skulls made of wood, skulls/Halloween masks, spoons with carved skulls, key-chains/skulls and other crazy items of this kind. 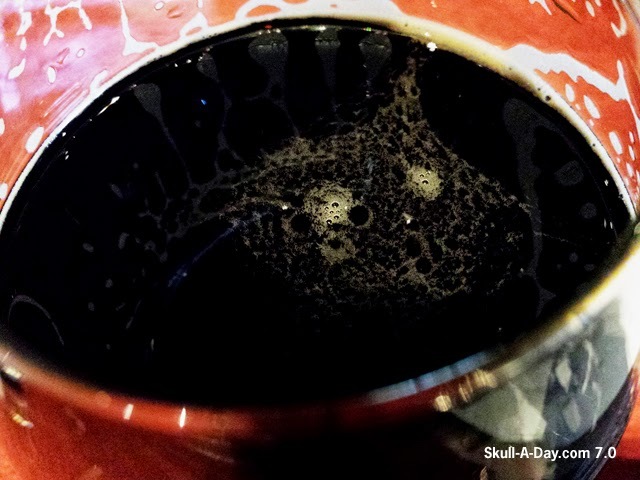 He would like to share his love of skulls with our Skull-A-Day fans. He is giving away one of his birch wood skull masks to one lucky fan! HOW TO ENTER: To enter this contest, comment below with your answer to this question. Where would you wear this skull mask? For example, I'd go to a local park, climb a tree, and have a friend take photos of me wearing the skull mask. CONTEST CLOSES: 11:59:59 PM Eastern USA Time Friday, April, 11, 2014. IF YOU DON'T WIN: Robertas is offering a discount of 20% for Skull-A-Day fans, in his store Wooden Skulls. Enter discount code "Skulladay" at checkout. You can go back in time on our site and find more of Bon Barde's other excellent works here and here, but first take a moment today to marvel at some of his new stellar skulls made from upcycled materials. The debonair ring is made from a foot of acajou from Congo. 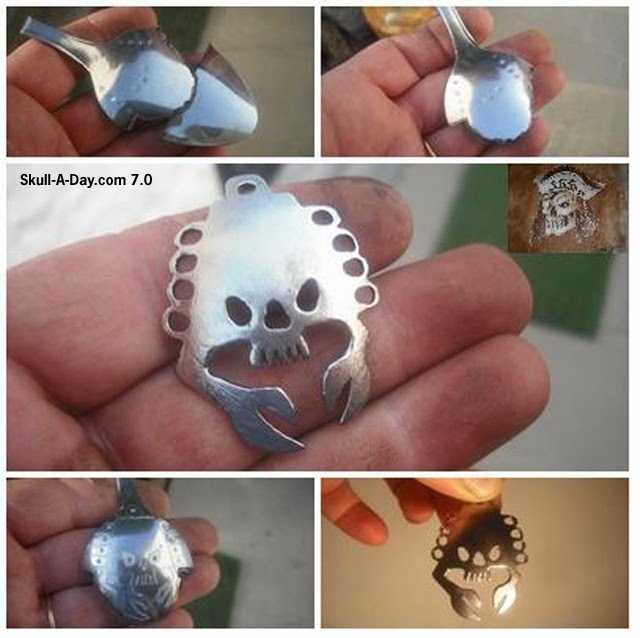 The crab skull pin is fashioned from a fractured spoon and designed for a biker named "Crab". I truly enjoy seeing the manufacturing process images. We get a little more insight into the mind of a very creative spirit. Merçi encore for sharing the results of your visions with us, Bon!